This topic warrants at least half-a-dozen posts but to at least start this favorite topic of mind, here’s what I have going on today. I should preface this by explaining that I’m going to NYC for a very quick trip planned just last week for some Slow Food USA board work. This trip has inspired quite the variety of food-as-gift and food-in-trade scenarios. 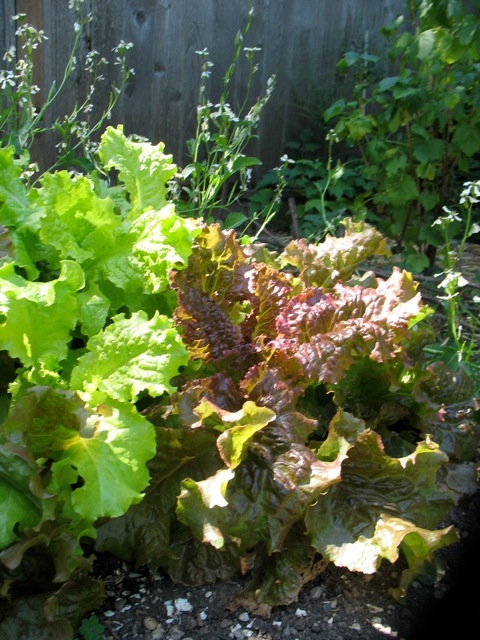 First of all, I have lots of beautiful lettuce that is going to bolt soon. 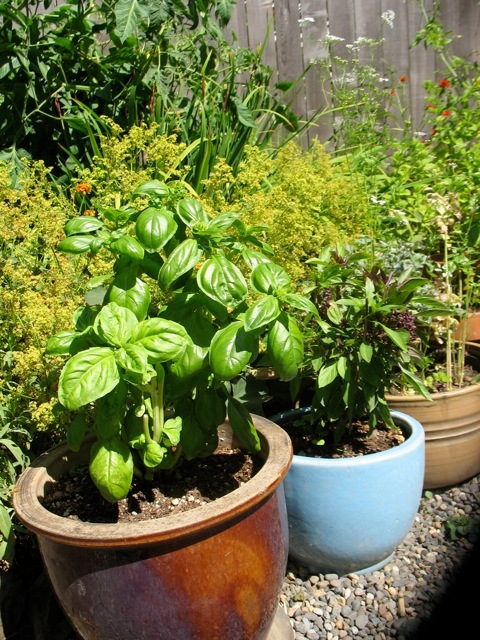 And I have basil, which did ultimately survive the wet spring and is now prolific. While I’m out-of-town I don’t think my husband will have time to put this to use so I offered it up on Facebook. My neighbors weighed in first so they’re going to get it. Secondly, I have a limited wardrobe these days. Three-and-a-half years of raising a kid and working from home, in the garden and kitchen, does not make for a New York City meetings and dinners kind of wardrobe. However, I have a great summery dress that I rarely wear and I finally figured out that it’s just a bit too long. So, my wonderful neighbor Bev who is an accomplished seamstress fixed this problem for me last night. So she gets Yogurt Panna Cotta with Apricot Compote this evening in exchange. 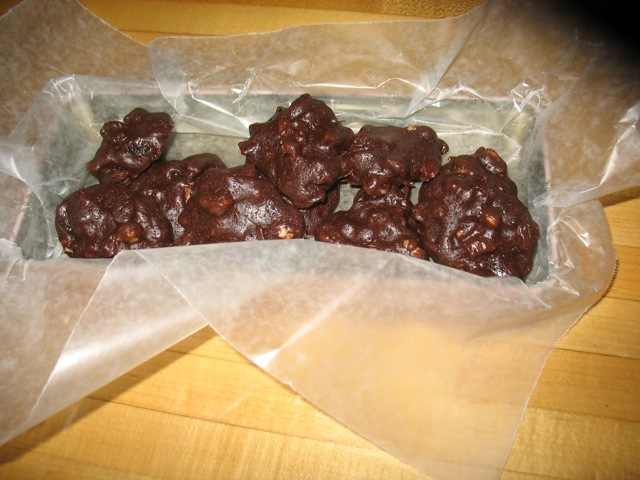 The third food-as-gift endeavor involves baking a batch of my new favorite cookies which will be split three ways 1) my host and dear friend Gail in Brooklyn, 2) the fabulous Slow Food USA staff, and 3) and my husband and son. Fourth, today a friend migrated all my data from my ancient and dying computer to my new (refurbished), shiny laptop for me. This will promptly result in a meal plus dessert upon my return. My first forays into cooking involved giving it as a gift and I got hooked on the pleasure of creating something edible to share or give away. My mother, who as you know, influenced my approach to food and cooking in innumerable ways, always brings a tin of cookies to meetings. So as I finish this post in mid-air, flying past Mount St. Helen’s with two cookie tins at my feet, I am grateful for the gift of food. When I was growing up I often woke up to the smell of frying onions and bacon wafting up the stairs, and not in an American-breakfast-hash-sort-of-way but in a German-Zwiebelkuchen-sort-of-way. Zwiebelkuchen is kind of a cross between pizza and Quiche with lots of sautéed onions, bacon and cheese. It’s a great dish to feed lots of people, keeps well, etc. So my mother, always needing lots of food for our household, started early while she was also making breakfast. Other days she’d have a lentil soup simmering away while we were heading off to school. So the idea of getting a jump-start on dinner in the morning has often been part of my routine too. These days I’ve been hard boiling eggs and cooking potatoes and green beans in the morning so that I can throw together a Nicoise Salad in a few minutes at night. The warmer weather has inspired more cold suppers and one of my favorites is a pasta dish with a raw tomato sauce (just blanch a few tomatoes, peel them and whizz in the blender with 2 handfuls of basil and 4 tbs of olive oil and salt) that you toss with room temperature pasta and diced fresh mozzarella. So I cook the pasta in the morning, toss it with olive oil and it’s ready for the sauce and hungry boys in no time. There are infinite ways to split up the dinner cooking whether you start the night before while cleaning up dinner or the next morning. And I feel downright smug sometimes when I sneak steps in that way. You can make a pesto or other sauce in the morning and cook the starch in the evening or cook some rice in the morning and toss with a vinaigrette and fresh veggies at night. You get the drift. So, here’s the Nicoise recipe and a link to my August classes in which we’re cooking fabulous summer fare like this. 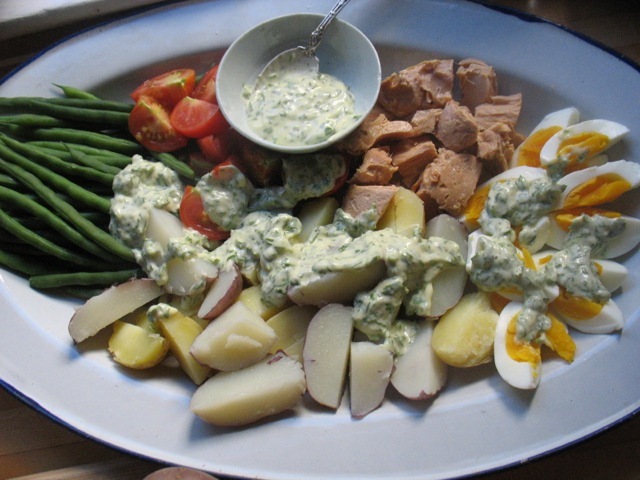 My version of a Salade Nicoise, with a creamy dressing–and not lettuce or olives. It’s a great idea to adapt to your taste and what you have on hand. I have adapted this classic composed French salad to my tastes over the years so this is not entirely authentic but very delicious and one of my favorite summer dinners. It’s a complete meal and beautiful to boot. As usual, please use the quantities as a guide. They are approximations and I vary them depending on how much of what I have on hand. There are very few hard and fast rules about this. And all of the components keep and are wonderful the next day so don’t worry about making too much. Cook the potatoes in salted water until tender but firm. Remove potatoes from water and let them cool. You can cook the green beans in the salted potato water so don’t throw it out. Add a bit more salt to the water and bring back to a boil and then toss in beans and cook for 4-5 minutes until tender but not mushy. The flavor of cooked green beans is much better (in my mind) when they are fully cooked and no longer “squeaky” but certainly not mushy. 1 teaspoon or more, lemon juice or white or red wine vinegar. Mix all ingredients together well. Adjust seasoning to your taste with more lemon, salt, or pepper. If you don’t have any mayo on hand the traditional Nicoise calls for a vinaigrette so substitute the mayo in the above recipe for 1/3 cup of good olive oil and add more vinegar or lemon juice. On a large platter arrange the potato chunks, green beans, eggs, tomatoes, olives, and tuna. Drizzle everything generously with the dressing and serve. Try as I might, I did not manage to write a post last week. 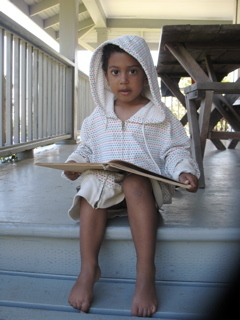 We had our annual family beach week and though I took my laptop, not much work transpired. But I did cook and bake–cherry pie, soba noodles with a cilantro and ginger dressing, pancakes with raspberry syrup . 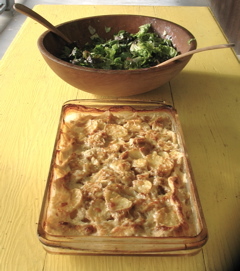 . . and these fabulous scalloped potatoes! Scalloped potatoes are kind of an old-school dish I think. My grandmother made them all the time (she topped hers with a layer of little pork, breakfast sausages:) and I grew up making them-sans sausages-with my mother. In fact they were one of the first dishes I made for my family for dinner all by myself when I was about 10. I remember it distinctly because I was in a bit of a black pepper phase. I ground so much pepper on each layer of potatoes that it verged on inedible. My family was gracious about it but that pepper phase lasted a couple of years. So, I’ve always layered potatoes with whatever herbs, cheese, veggies, or spices I was using at the time. However this last week at the beach, wanting to spend more time reading in the hammock, I scrapped the layering and just tossed everything in a big bowl, put the mixture in the baking dish, added milk half way up the potatoes and baked it. Voila! Don’t know why this just occurred to me! It was just as delicious as always and much faster–actually better I think because the flavors were more evenly blended. Now I’m going to use this technique for other gratins, using summer squash and I don’t know yet what else, but I’m excited to experiment. A friend recently lent me Mark Bittman’s Kitchen Express. It’s a wonderful book of quick meals and what I like most is that his recipes are written in a paragraph or two with no long lists of ingredients and detailed instructions. The subject of recipe writing and how much detail to give warrants a whole post but in short, I would like to think that with some dishes, describing the process with approximate quantities give the cook more freedom and license to use whatever he/she has on hand and to taste and experiment along the way. Cooking can be very fun this way and in my quest to get people cooking more often, it’s an important part of demystifying the process and getting people to think about what they really like and how they might turn that into dinner every night. It really can be simple, fast, delicious and fun. 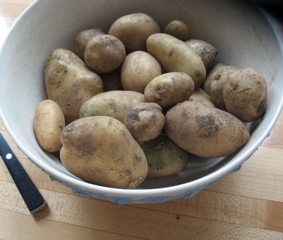 Scrub and thinly slice (by hand, slicer on a box grater, or food processor) about 2 1/2 – 3 lbs of waxy potatoes (not Russets, all other kinds work well) and put in a large bowl. In a small bowl mix about 1/4 cup of flour, 2 + teaspoons of kosher salt, a few grinds of black pepper and whatever other seasonings you like. I used 2 1/2 teaspoons each ground cumin and pimenton (smoked Spanish paprika) and 1/2 teaspoon chili flakes. Grate some sharp cheddar, gruyere or other cheese of your choice. Finely dice a small onion. Mix the flour spice mixture with the potato slices and toss well with your hands. Add the grated cheese and onions, toss again. Spread mixture in a 9 x 13 baking dish, pat down a bit with a spatula. Pour milk (or broth/stock of some kind) about half way up the potatoes. Sprinkle the top with a bit more grated cheese and bake at 400 degrees until potatoes are tender and easily pierced with a fork about 45 minutes. Finish under the broiler for a minute or two if the top isn’t well-browned. Variations include lots of chopped herbs like parsley, marjoram, chives or oregano, diced bacon or slices of sausage, minced garlic, finely chopped greens or peppers, etc. And on a completely different note, I have to include this photo of the blissful, beach week! Happy cooking and eating and reading everyone!